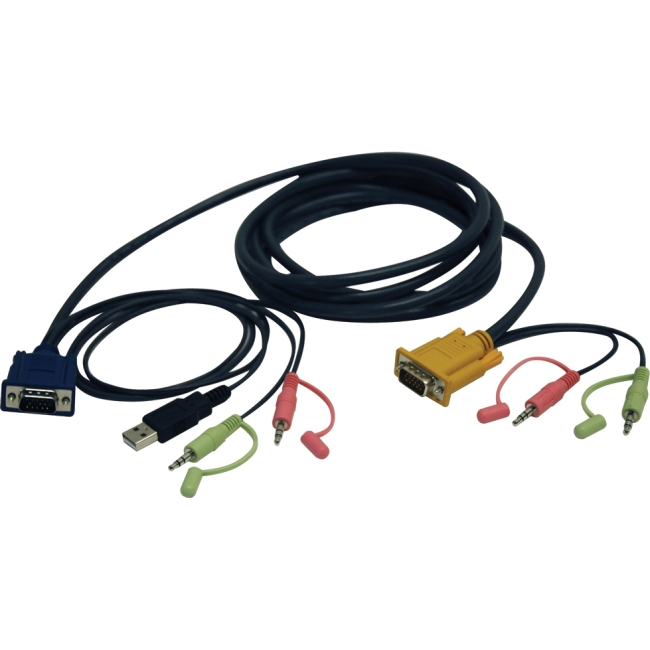 Tripp Lite's 10-ft. USB (All-in-1) KVM cable kit is designed to connect a USB computer to Tripp Lite's B006-VUA4-K-R KVM Switch. This premium All-in-1 cable provides superior performance and cable management. The KVM Switch side of the cable kit consists of a HD15 Male cable, plus two 3.5mm stereo connectors. The computer side of the cable kit consists of a HD15 Male cable, USB A Male cable, and 2 x 3.5mm stereo connectors for Speaker and Microphone connections. All cables are manufactured from superior molded cabling with integral strain relief and foil shielding for maximum EMI/RFI protection.